Have you had those moments when you have nothing much to do and you start tinkering with stuff? Sometimes you'd clean out your closet, purse or your laptop / gadget and find "treasures" you've long forgotten about: a top you haven't worn that still has the tag on or a precious photo tucked several folders deep in your hard drive. Well that was what happened to me last night while I was waiting to drill / review my son in preparation for his test. I found this 4 year old video I made. 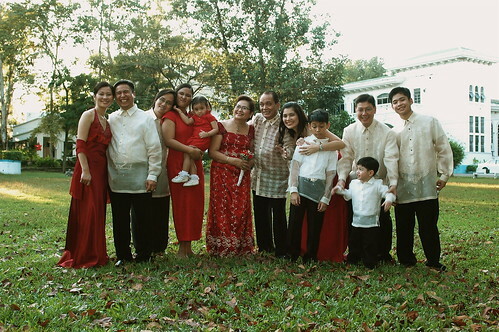 It was taken during our Pa and Ma's 40th wedding anniversary in Cebu in 2006 which my siblings and I prepared from scratch with whatever limited resources we had. There was no event planner engaged. Junnie bankrolled a major part of it. I had to design the invitation which my sister, May, finished off, assemble the giveaways (rosary bracelet in a red velvet pouch we had made), order red roses for the church, book the Pedro Calungsod chapel, reserve Mayi restaurant for the reception, engage Odik Lara for the photography (no video), and rent the van for the day. It was pretty challenging before and during the event, but we managed to pull it off. Looking back four years hence, all I could remember are the happy moments we had as we celebrated that milestone. I have this video as proof. Was that 4 years ago already? Where did the time go? And Gratitude Journal is now 1 year old???? grabe. I don't remember seeing the video then, maybe I'm getting old and forgetful. Counting down the days to Mama's and Papa's second sojourn to Canada! the video was from a collection of pictures i arranged for a photobook which i intended to have printed but didn't get to do. so i made a video instead that i intended to burn to a cd but still never got to do. haysss. such things happen when life seems to pass like a blur and we're preoccupied with other stuff. happy anniversary to us in gratitude journal! post some pics and blogs about ma and pa's canada trip soon.